The octave is the most typical node point used as it produces a pitch of great clarity and sustain, particularly when used in the lower registers of the instrument. 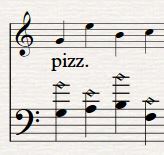 Other node points such as the twelfth (produces the fifth) or double octave can be used but pizzicato of the first octave produces the greatest clarity and sustain. Lower stave shows the pitch and relevant node point, the upper stave the resultant pitch.